Cats are wonderful companions. Most people prefer to select a cat as a pet rather than a dog. A cat’s health, nutrition and diseases which it is susceptible to must be taken into serious consideration. Mentioned below is a guideline to cat health and cat health problems for a pet owner to better understand some of these problems. What Are Some Of The Common Diseases Cats Are Prone To? A feline is subjected to various cat diseases such as food allergies, fleas and mites, rabies, diabetes, liver and kidney disease, urinary tract disease, cat fever, feline acne, parasites or tapeworms (FUS) or Feline Urological Syndrome, (FIV) Feline Immunodeficiency Virus. How To Know If A Cat Has Rabies? Rabies is considered an indigenous disease except in a few countries such as Great Britain and Japan and identified as one of the cat diseases. Rabies virus survives only inside the body. A bite wound generally transmits the disease through means of the virus being shed in the saliva. A cat must be incubated between three and eight weeks. When rabies symptoms occur, it is considered to be fatal and death takes place within 10 days. Some of these symptoms when it occurs in a cat are agitation, aggressiveness, irritability, nervousness and viciousness. There is excessive salivating and drooling and difficulty in swallowing. After seven days the cat falls into a paralytic stage. Why Do Cats Lose Their Hair? A common reason for cats to pull at their hair is allergy to flea bites. Mites also cause cats to pull at their hair. There is a condition known as mange, which makes cats chew at their fur in order to relieve themselves of constant itching. Ringworm causes hair loss around the ears, face and feet. This is a fungus that results in cat hair loss. The skin becomes dry, flaky and gray and the hair falls off in small patches. Certain glandular disorders can result in cats losing their hair. This results in overproduction of steroids, but is a rare condition. Another cause for hair loss is known as alopecia. This is when a cat due to stress, nervousness and other psychological factors start pulling at their hair. If your cat suffers from fleas, using flea dips for cats is a great way to get rid of them fast and effectively. What Causes Cats To Have Bad Breath? One of the cat health problems is bad breath. Tatar build up can cause a cat to have bad breath. Resorptive dental lesion also causes bad breath. These lesions tend to be painful. The lesions affect the root but occur below the gum line. Gum disease or gingivitis result in bad breath. Some of its symptoms are bleeding, swollen and puffy gums. Feline leukemia, kidney and liver diseases also can cause bad breath. What Should A Cat’s Diet Consist Of? Cats are carnivorous by nature. Good cat health depends on a cat’s diet. It must include two amino acids which are essential known as arginine and taurine. Vitamins such as A and C, dietary proteins, Niacin and arachidonic acid, carbohydrate, protein and a fat rich diet for a cat to grow to be healthy is essential. When Should A Cat Be Vaccinated? Cat health problems start when they are not vaccinated on time. 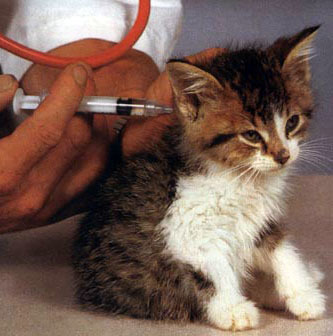 A kitten must receive its vaccination when it is 2 months old. Kittens receive 3 sets of shots between three and four weeks apart. This helps increase the immune system in a kitten and refrains it from contracting any infectious cat diseases and cat fever. A veterinarian’s recommendation will be provided for a kitten’s vaccination schedule and once the kitten has completed its course a certificate will be given. cool what would you do for a powerpoint slide on kittens? don’t stab cats in the ear.